Reo-chan, a first year girl, gets dumped by her boyfriend because she's not skilled in the home economic traits women should possess in his mind. Her ex tells her that she must apply to a "housework" club before he reconsiders going out with her. Therefore Reo-chan has little choice but to join. But here's the catch: the only members are four gorgeous bishies. The other first year in the club, Irinaka, competes with her a lot. As the story progresses Reo and Irinaka get forced into a lot of interesting situations together and in the meantime become closer and closer. 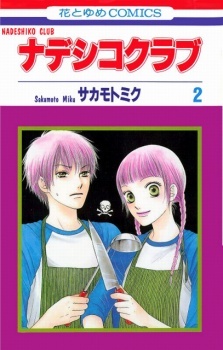 It is a cute story of a girl who joins a home ec club which is populated by guys. There is some romance, but (happily!) this is no reverse harem story. The two main characters are helped along in their romance by the rest of the club. The bulk of the story focuses on the running of the club, and I do enjoy that aspect of the story very much. The story was sometimes a little hard to follow, as the art was not always clear, and it could be hard to see who was speaking. Despite this, there is quite a large cast, and the 7-8 main characters are all well drawn, and quite distinguishable from eachother. And the characters are all rather nice. But surficial. So surfiical. There is some character development for the younger characters, but the senpai's remain at a distance. This a shame, because some of the best story arcs involve them. That was rather diappointing. Overall, there is a really nice relationship between all the club, and that was charming.